Eurocircuits has announced the launch of two pooling service offerings. SEMI-FLEX pool is described as the first cost-cutting order-pooling service for flex-to-install PCBs, whilst NAKED proto offers prototype and small-batch PCBs, delivered without soldermask or legend, at prices approximately 50% below fully finished PCBs. NAKED proto (above image) has been developed for engineers who want to modify their proof-of-concept PCB’s on-bench by cutting tracks or soldering links. Soldermask and ident make this more difficult, so they are dropped for NAKED proto. The boards are made on Eurocircuits’ proven production lines, and users of the service have full access to the company’s online manufacturability and data checking tools. NAKED proto’s cost savings have not been achieved by using cheaper materials or processes. Eurocircuits have more than 15 years’ experience in order-pooling (combining several orders of a single production panel). By dropping the mask and legend and leveraging the cost- and time-saving power of pooling, the company has cut prices for the NAKED proto service to around half the price of fully finished PCBs, and can offer a 1 day delivery. Dirk Stans, Eurocircuits’ Marketing Director, explains how NAKED proto helps to foster the next generation of PCB designers: “Our mission is to provide a complete service to the PCB design sector. For today’s designers we offer a range of services and tools to help bring designs to market on time and on budget. For tomorrow, we want to encourage and develop a new generation of engineers. We already sponsor student projects across Europe. We see NAKED proto as part of the same mission. We can help tomorrow’s engineers, whether students or hobbyists, by providing affordable prototype PCBs for their personal projects. Low cost cannot mean lower quality: they need to debug their designs, not their fabricator’s PCBs. NAKED proto gives them access to low-cost PCBs of proven quality on reliable deliveries from a leading European supplier, who can also support them with technical back-up from white-papers and blogs to online chat with PCB engineers”. Many flex-rigid circuits are not required for continuous flexing, but to fit boards into complex spaces without using connectors and cables. The flex element is polyimide, a material expensive in itself and needing special processing. SEMI-FLEX (pictured above) offers a more cost-effective solution. 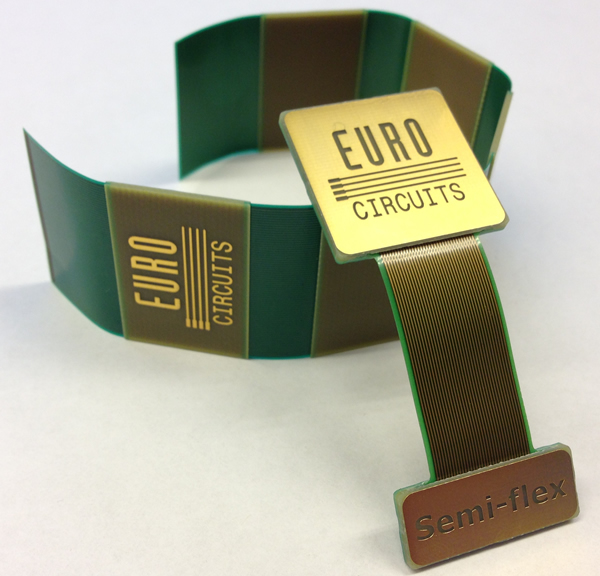 Conventional flex-rigid PCBs use the polyimide layer to flex between the rigid FR4 areas. SEMI-FLEX PCBs are made completely of FR4, using a thin FR4 section which can be bent for a limited number of times at a controlled radius. This is a suitable solution where two or more rigid areas of the PCB need to be installed at an angle to each other but continual flexing is not required. Designing a single SEMI-FLEX PCB eliminates the need for cables and connectors, saving PCB space, lowering costs, cutting design, procurement and assembly times and increasing product reliability by reducing the number of solder joints. Eurocircuits have chosen a 4 layer configuration. The flex area is part of a 100μm inner core with 35μm of high-ductility copper on each side. The alternative technology is to depth-mill through the PCB to leave a thin section on an outer layer as the flex area. Eurocircuits have opted for the inner core solution, even though it is more complex to manufacture. It offers a precise thickness in the flex area as well as a symmetrical build and so a more stable PCB. For the designer it makes it much easier to design a triple configuration with an up and a down bend or a final Z-installation.